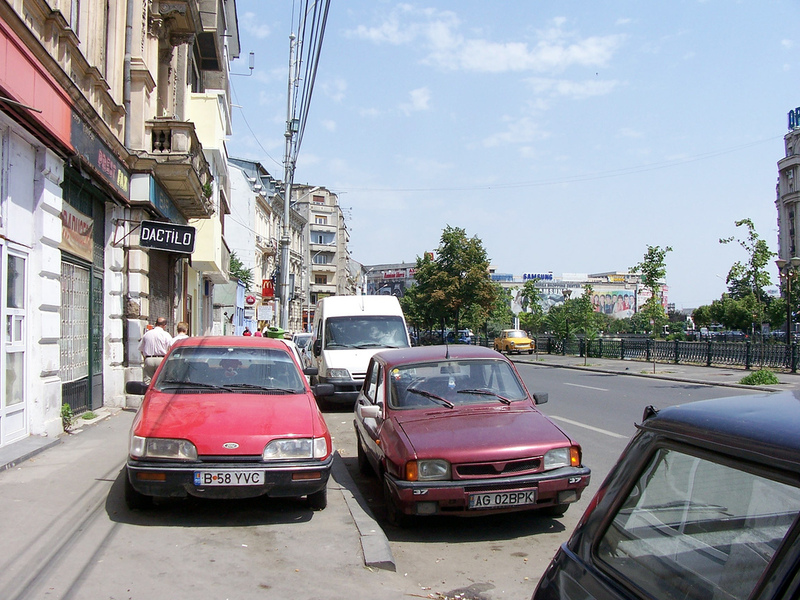 In Bucharest the way of solving wrongly parked car problems is either towing them away using spider cars, or by putting little poles in the ground. These poles prevent cars from actually stay on the pavement. The question is; what exactly does the city of Sorin Oprescu Bucharest wishes to achieve by this. 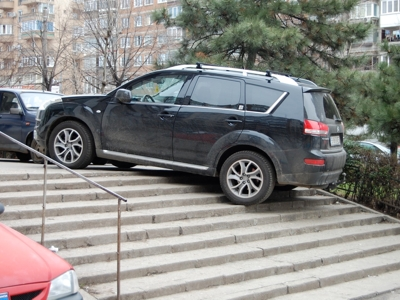 In general, people park their vehicles wherever they want look for example here. First of all there are more things going on than just wrongly parked cars. 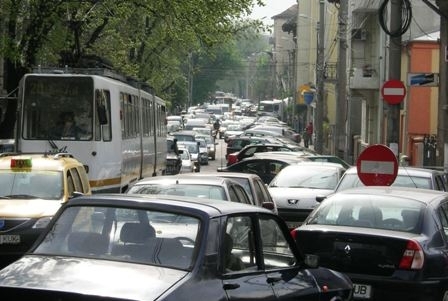 In the overall of things it is clear that there are too many cars in Bucharest. Every day during rush hours this is blatantly visible. One could argue that there are lesser roads, but constructing new roads is a hell of a costly job. And in most areas, like Magheru Blvd, there is simply no room for widening the roads. All these cars in the city all day long create a massive pollution to the inhabitants and the buildings. The only nice white buildings are those in Lipscani and concern banks. The rest is black and brown whilst they are supposed to be white. It gives the city a grey and depressing look. Then there is the way people act like idiots in the car lanes drive their car in the city. Simply just doing as they see fit overtaking left and right, crossing white lines, it is as normal as breathing here. And the inevitable blowing the horn if something is not to the satisfaction of a driver seems to be the national sport. As a pedestrian in Bucharest, you are uncertain whether you will make it from A to B in time and safely. On average 15 ambulances a day race by (at the same spot!) the traffic also, usually getting stuck in the jammed traffic, especially when car drivers use the tram tracks, another favorite pass time. You can choose either for a mentality change, or a robust solution that will only push the problem to the neighbor. Plant a pole in front of your door and it prevent a car from parking there. That means the driver who planned his car to park there will move it to the next available place on the pavement. To your neighbor, who did not plant that pole. This mechanism failed and has been reputedly researched in cities where the problems are the same. Usually, when you run the show in a city you take a close look at cities with similar troubles and gain that existing expertise to your own benefit. But not in Bucharest. In good old fashion: we just do something. But, that is what you get when you put a medical doctor in charge of running an entire city. Where Pierdone sector mayors have their own news papers promoting themselves. Plunging money around that could be used for increasing the living comfort on vases and fountains picked from a catalogue across the sector for the enjoyment of people. Whilst being as a city in shortage of money there is a much more effective way to change a mentality and to make money as a bonus. Fining every wrong parked car! It is less costly for the city of Bucharest than planting poles every meter. You can use the existing police force to do this as they are not visible doing to many things anyway paid to uphold the rules. In return you gain a lot of money from wrongly parked cars which can be used for usefull things (fixing roads, fixing water pipes anyone?). Hitting someone’s wallet will change the mentality of the driver. Instead of using the pavement, he will go in search for a different more suitable free spot. Or better, he will choose to take the public transport, which is fast and cheap. Even better it would be if this public transport would be for free. But that is another story.